Orange sage bread is a lovely, light bread that can be sliced, toasted, and served with orange marmalade for breakfast; or consider serving it with fresh fruit and cheese for an outdoor lunch. This recipe is easy enough for beginner bread bakers to make and joy for more experienced bread bakers. 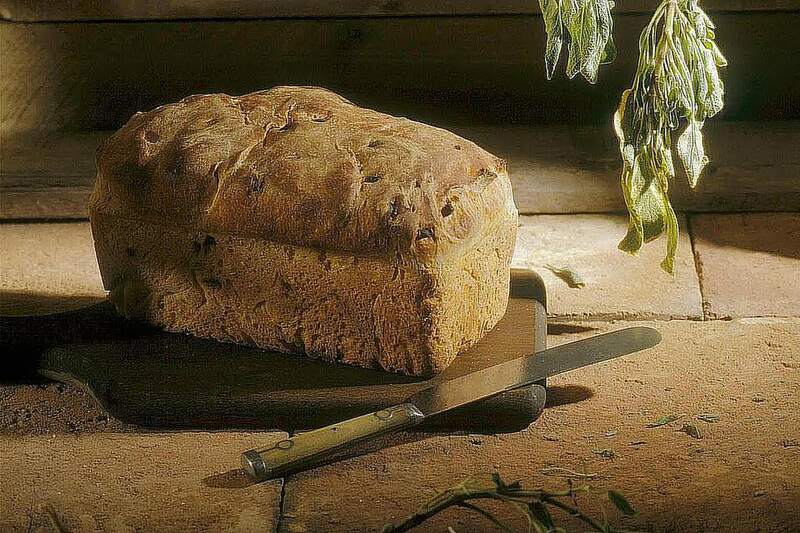 The ground sage and touch of orange gives the bread a sophisticated flavor that everyone can enjoy. In a large bowl, add the orange juice, water, vegetable oil, grated orange rind, sugar, yeast, sage, and salt. Mix until the yeast and sugar are dissolved. Mix in enough flour, a half cup at a time, to form a soft dough. Turn dough out onto a floured board and knead it for about 5 minutes, adding more flour, a tablespoon at a time, if needed. Put the dough in a greased bowl, turning it so all sides are lightly greased. Cover the dough and let it rise in a warm place for 1 hour or until doubled in bulk. Punch down the dough and turn it out onto a lightly floured board. Quickly knead the dough for about 2 minutes to get the air bubbles out. Shape the dough into a loaf and put in a greased 9 by 5 by 2 1/2-inch loaf pan. Cover and let rise for 30 minutes or until doubled. Bake at 375 F for 45 minutes, or until golden brown. You can use this dough to make braided rolls or swirl rolls. When grating the orange zest, make sure to only grate off the colored part of the peel. The white part, called the pith, is bitter and will impart this flavor to the bread. Keep yeast stored in an airtight container and in the refrigerator. Heat, moisture, and air kills the yeast and prevents bread dough from rising. To keep the bread soft, store in a plastic bag. Store flour properly to keep it from spoiling and from getting bugs. Bread flour has a higher amount of gluten than all-purpose flour. This means that bread made with bread flour will rise higher than bread made with all-purpose flour. You can make your own bread flour by adding 1 1/2 teaspoons gluten to each cup of all-purpose flour you use in your bread recipe. Instead of using sage, you can substitute rosemary or thyme, as these herbs also blend nicely with the taste of orange. And if you would prefer to use lemon in place of the orange, just keep in mind that the bread will be missing some of its sweetness; you can pair almost any herb with lemon for this bread to work.